If you like fantasy gaming, then you are going to love what we have found for you! NetEnt have cracked it once again with an epic slot filled with suspense, features, and incredible graphics. We welcome you to a world where there is a battle ongoing, in Warlords: Crystals of Power. 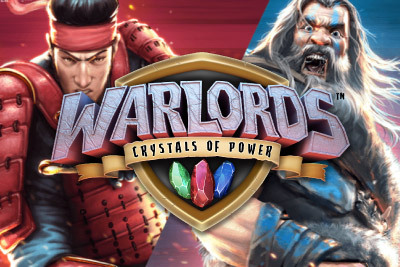 Warlords: Crystals of Power is a 5-reel, 30 fixed pay line slot, offering a mighty 96.89% RTP for those that join the fight. The reels spin against a battlefield backdrop where the characters are trudging off to war. At the beginning of the game you see a short introduction video, showing you the three warlords preparing for battle. A samurai warrior, a priestess and what looks like a Viking warrior all with their own crystal but wanting more. Bet Amounts – Betting begins at just 30p per spin and can be increased to a maximum of £30. The fact that the slot is so affordable and has such a great RTP is what has made Warlords: Crystals of Power so popular. Wild Symbol – Your wild symbol is the three crystals of power encircled in gold and it will substitute for all other symbols except the scatter flags. It joins the samurai warrior as joint highest paying symbol, offering x300 coins for landing 5 on an active pay line. Scatter Symbols – In Warlords: Crystals of Power there are three scatter symbols, all of them are flags but each one is a different colour. Red representing the Samurai, Green representing the Priestess and Blue representing the Viking. You need to land at least two of the flag scatter symbols to commence one of the many scatter activated features. Priestess arrow – will add 2 to 5 wilds anywhere on the reels. Battle Respins Feature – Landing two or more different scatter symbols on reels 2, 3 or 4 will commence the battle feature. The battle is figurative, and you don’t actually witness anything happening. But once the ‘battle’ is done one of the two scatters will be the victor and the other will change to match the winning symbol. Once this happens the reels will respin and award more matching scatter symbols. Each symbol that is present on the reels once the respin has ended, will award a number of bonus spins to be used in the next round. There is the possibility that the respin may not award any extra scatters and you need at least three to activate the bonus spins round, so you get one last chance. Last Chance Feature – Should you not have been awarded the third scatter needed to trigger the bonus spins, the last chance feature will activate. A giant burning rock will be hurled at the reels and will hit one symbol. If it turns into a scatter, then the bonus spins will begin. If a scatter isn’t revealed, you will be allocated a coin win and then you will return back to the main game. 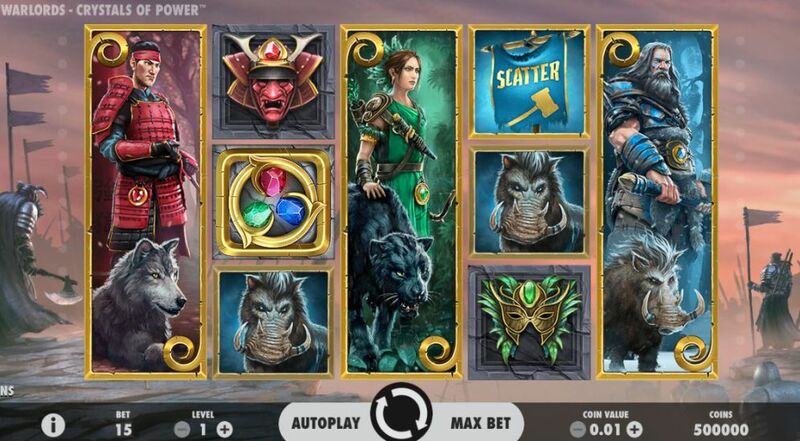 Viking Blue Scatter – allocates 9 bonus spins and each scatter that lands will award +3 extra spins. In this round, only the Viking and the animals are present on the reels ensuring higher value wins. At a glance we knew that Warlords: Crystals of Power would be a great game to play and we were not disappointed. It is fast paced, high energy and you just can’t help to get invested in the game with its animations, soundtrack and above all those features. Yes, the wins came often and that is brilliant, but it is expected with a high RTP. What won us over was the not knowing what will happen after the battle feature. To say our pulse was racing is an understatement!